Eventually I spent this weekend on town and was able to attend Borneons Donate‘s charity. This was their tenth charity but actually my first one with the Borneons. It was held in an orphanage in Balikpapan named Nurul Iman. 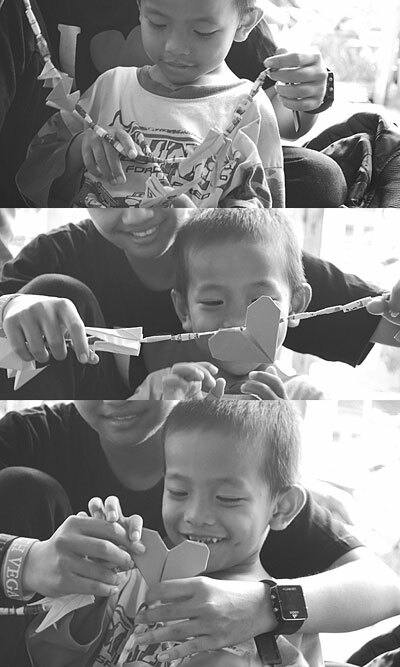 I had a lot of fun taking pictures of the children smiling while making some handcrafts. For such activities, I wish I had more free weekend on town instead of on board :P.
Borneons Donate was originally inspired by Shoebox Project, initiated by Beriozka Anita in Jakarta. Shoebox Project has slogans: “Karena berbagi adalah kebutuhan, bukan kewajiban” (“Because sharing is a need instead of a must”), and “Karena sepatu yang membutuhkan kotaknya, bukan sebaliknya” (“Because it’s the shoes that need the box and not vice versa”). Earlier, I didn’t really notice about the second slogan, while the first one has existed in my family. Since I was little, Bunda (mum) has got me used to doing such things, sharing and interacting with the less unfortunates. She told me that when she was young, she didn’t have much money so she usually just came to the nursing homes and talked with the grannies. It wasn’t about ‘giving’; it was ‘sharing’. When she came, she sometimes cleaned the room, put some air freshener, or reorganized their stuff. Until now, Bunda is still doing this, even better because she can give some money as well as energy. One of the biggest lessons I learnt was the importance of interaction. Especially when it comes to children and the seniors who are more or less the same; on the phase where money doesn’t matter that much (yet / again). They need the feeling of being meant and needed. They also need the feeling of being human being. But then, if we rethought about it, we would realize that those needs are not only theirs, but also ours (the relatively-more-fortunate-s). Let me repeat: the need of feeling meant and needed; the need of being a human being. For some of us it might also be the need to see happy smiles on others’ faces. So I’ve just noticed that shoe is a good analogy: No matter how expensive a pair of Jimmy Choo stilettos is and no matter how papery the box is; it’s the shoes that wouldn’t be okay without the box. No matter how wonderful you think you are, if you are really great then you would always need the others, no matter how small you think they are. PS: Some other of my favorite photos are here.